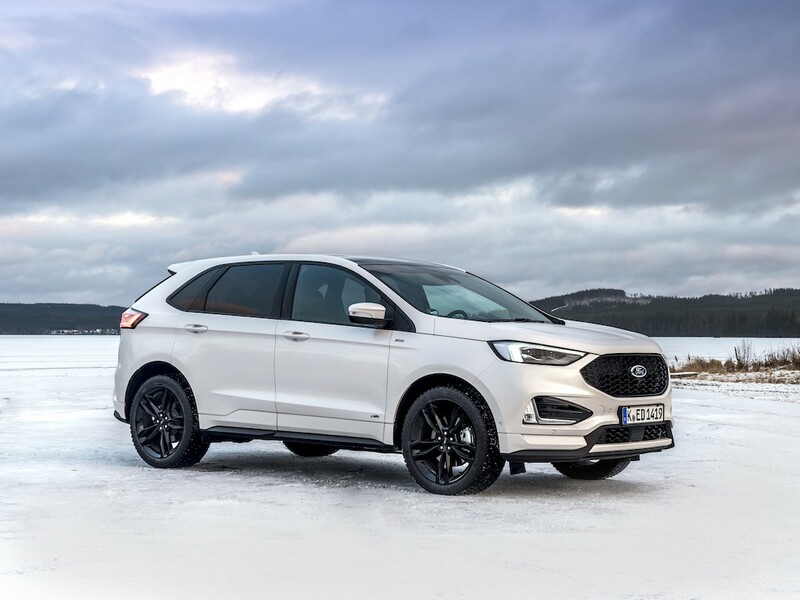 Ford’s facelifted Edge SUV is now available to order, bringing revised design, new driver assistance tech and an updated powertrain line-up, including its first two-wheel drive model. Still only available as a five-seater, the revised model introduces a new engine line-up based now on Ford’s latest 2.0-litre EcoBlue bi-turbo diesel engine. This is offered in a new 235bhp version married up with an updated version of Ford’s Intelligent All-Wheel Drive, which can shift to two-wheel drive quicker when possible to save fuel and features Ford’s new eight-speed quick shift automatic gearbox; emissions start from 175g/km. The only other engine is a new entry-level 148bhp version of the 2.0-litre EcoBlue with front-wheel drive – marking the first time that FWD has been available for the range. Paired up with the eight-speed auto, this brings emissions from 153g/km and fuel consumption from 48.7mpg. The entry-level unit comes in Titanium priced at £36,995 and features equipment including 19-inch alloys, power fold mirrors, dual exhaust, perforated leather seats, Ford DAB Audio with navigation, SYNC 3 with eight-inch colour touchscreen, keyless entry, handsfree power tailgate, front and rear sensors with rear-view camera, adaptive cruise control and automatic headlights and wipers. The 235bhp variant is available on ST-Line (£42,995) and Vignale (£45,995). Equipment for the ST-Line includes 20-inch alloys, sports suspension, 10-way power driver’s and passenger’s seats with memory on the driver’s, variable heated front seats and heated steering wheel, cruise control with collision mitigation, B&O audio system with 360-deg sound and the FordPass Connect embedded modem with two years’ free live traffic. The Vignale comes with the standard suspension, adaptive LED headlamps, 20-inch alloys while the interior gets leather detailing and Vignale features. Fleets can also opt for the Ford Co-Pilot360 driver assistance technology package, which comes with features including adaptive cruise control with stop & go and lane centring, evasive steering assist and cross traffic alert feature.